Many women looking for exercise to lose belly fat are many times turned off because they want to know their new program will work, they can ease into after years of inactivity, and that their fat loss will be safe. Unlike men, who can't seem to wait to get into a gym and start lifting weights or getting on a Stairmaster to lose belly fat, women want to feel better about how they look and their level of fitness before they invest in a gym membership. Women do not want the added discouragement of feeling too fat, too unsure about exercising, or too unfit to make it through even a basic program. They do not want to become so discouraged that they attend infrequently...or worse...quit altogether. Women's fat loss plans do not have to be complicated or make you fel uncomfortable. Walking is probably the best way to ease into an activity program to help your fat loss goals. You can choose where you want start (beach, neighborhood, park, mall), if you want a partner or not, and what you want to wear. * Start your program easy. You want to make sure you are consistent and committed to losing weight and belly fat. If you can only walk 10 minutes when you initially begin...well that is fine. You can build from there. * For the first eight to ten weeks, work on getting a solid base of endurance until you can comfortably walk for 30 minutes straight. * Once you have a good base, start breaking up your walk into short bursts (15-20 seconds) of brisk walking every three minutes. You'll feel a little out of breath, sweaty, and red in the face...but it will help you improve tremendously. Do this for 15 minutes in the beginning. Make sure you have a 5 minute cool-down afterward. * A study at the University of Virginia found that women who did three shorter (but fast-paced) walks, alternated with two longer ones at a moderate pace lost 5 times more belly fat and raised the level of fat-burning hormones more than women who simply continued their program of strolling. * Once you can walk briskly for 45 seconds every three minutes, you can start extending your total time back to 30-40 continuous minutes, but do it in 5 minute increments. * It took many years to put on weight, it will take some time to walk off belly fat. You want to do it safely, sensibly, and progressively. You will have even better success with safe fat loss if you integrate a program of good nutritional choices, drinking plenty of water to flush toxins from your system, and getting more sleep at night. 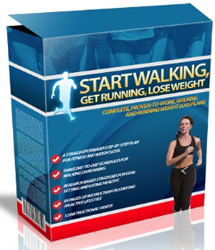 A good program we have found to help you start to lose belly fat and thigh fat...and make fat loss permanent is Start Walking, authored by David Tiefenthaler. It has helped thousands of men and women make significant changes in their lifestyle, and in turn, their health. You can make a fine start to walk off belly fat, but David's program will elevate it and help you deal with the inevitable plateaus when fat loss stops. His focus is on a change in lifestyle and how you view food, activity, and rest. The integration of a solid, proven, nutritional program with a progressive and flexible fitness program, will empower you to create an entirely new lifestyle.